Yesterday, we had gone to an Italian restaurant, Pasta Pomodoro. Both Susmita and I don’t frequent Italian restaurants very much, primarily because the food is quite rich and also, we (I) are (am) not great fans of pasta. Anyway, I wanted to take Susmita out yesterday to a different cuisine after the classes. Susmita is leaving for Israel at the end of the week and so, it is only natural that she be given super-special treatment :). Actually, I was visibly surprised by the quality of service and more by the quality of food. They were just superb. Before the waiter came to take the order, there was a manager who came and talked to us and made us feel “comfortable”. We ordered 1 Rigatoni and a Penne Portebello, in addition to a starter dish of Bruschetta. The food was just sumptuous and we had a wonderful time. Also, the price was very reasonable :). So, if you guys are in a mood to have something different from the usual fare of Indian/Chinese/Thai food, then this is a very good option indeed. Yesterday, we got new Cell Phones for ourselves. Our Cingular Wireless contract had expired and so, we were eligible for an upgrade. 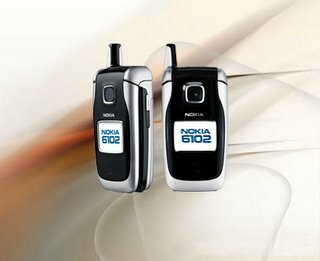 Since my Siemens cell phone was virtually non usable because a couple of buttons had fallen out of it, we decided to sign the new contract as soon it was possible and also get the new phones. As a result of this upgrade, we now have new Nokia Cell phones – Nokia 6102. We had to pay $29.99 in total for both the cell-phones – hopefully, they will be good. Traditionally, I am not a person who monitors the stock market very extensively. Of course, I do hear on and off that a particular companies stock has gone up or gone down. That was my extent of interaction with the stock market. However, in the current quarter at MBA school, I am taking this Investments course. In this, we are all given registration at a Portfolio simulation site – Stocktrak and we are each given $500,000 to start trading. Anyway, with that money, I have bought quite a number of stocks of my favorite company – Google. Tomorrow, Google will announce its 4th Qtr results of 2004 and if, I am lucky, then I shall make some money – however virtual it may be :). WILL HE OR WON’T HE ? In a short while, the 2nd day’s play of the 3rd test match between India and Pakistan at Karachi will begin. After all the action on the 1st day, it remains to be seen how the Indian batting line-up will survive the hostilities of the Pakistan bowling attack. Shoaib is just steaming up a few notches higher than he normally bowls, Asif is accurate, Razzaq is probing and so it will be a good test of nerves and attrition for the remaining Indian batsmen. 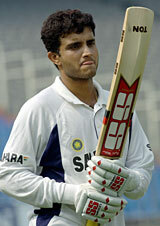 That brings me to one of the current overnight batsman – Saurav Ganguly. In the team for the 1-dayer announced yesterday, he does not figure in the 15. In other words, after this test, he will be heading home and probably, people will soon forget about him. Right now, he has the perfect platform to play an innings that people will remember for life – he has been India’s most successful captain and he deserves to retire more gracefully. The past few months have been horrible for him and so, he would like to conjure up some magic to show that he still has something left in him to fight. But it won’t be easy – the Pakistanis will give nothing away. This makes for some absorbing contest indeed. My money is on Saurav to go all out and play a terrific innings – but then, that may also be as a result of my bias for India. No matter what happens, it is going to be a terrific day of cricket – something, that we all have been waiting for in the last couple of weeks. 2005: Wimbledon mixed doubles with Mary Pierce. 2005: US Open mixed doubles with Daniela Hantuchova. 2006: Australian Open mixed doubles with Martina Hingis. Susmita was telling me about a course that she took on brands, patents and copyright. This led to a discussion on global brands and their net value in 2005. I found an excellent article that analyzes all the major brands and ranks them accordingly. No points for guessing what the source is – it is Businessweek. Today is the 26th of January – India’s Republic Day. Happy Republic Day to India and all its citizens.